The large-scale performance works generally involve live voice & electronics, multiple channels of projected video, and a set and lighting design. Some of them are solo and some include additional performers. They are appropriate for flexible black-box theatres or proscenium halls capable of supporting a lighting design and good quality (stereo or multi-channel) sound reinforcement. 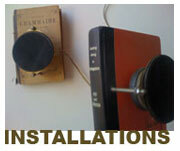 The installation works can involve any combination of stereo or multiple channels of audio, single or multi-channel video, and physical (found or fabricated) objects. The fixed media sound works are appropriate for playback in a listening room or gallery space, a tape music concert, or for broadcast. The works that involve video, objects, or some kind of interactive element, are sometimes better suited for gallery/exhibition spaces. 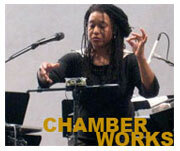 Pamela Z has composed a number of chamber works scored for various combinations acoustic instuments and live electronics or tape. Generally commissioned by new music ensembles such as Kronos Quartet, Bang on a Can Allstars, and Ethel, some of these works can be performed without the composer present, while others include a part for voice and electronics and are intended to be performed by the composer and the ensemble.